I gutted the stock air box and stuffed it with an amsoil maximum performance filter and drilled the cover! Amsoil filters flow air like K&n but stop dirt like paper filters. My future plan is to get a whipping cream dispensor NOS setup for pulling wheelies at ther push of a botton. Amsoil maximum performance 2 stage air filter. I also drilled holes in the engine cover to help it breathe. The int & exh gaskets were blocking airflow through the head finns so I trimmed them. 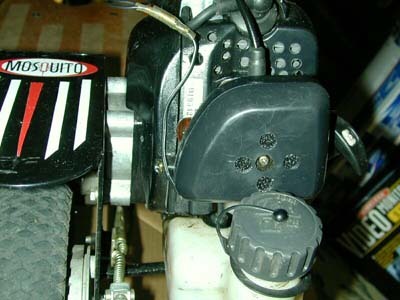 I attached a pic of my modified air cleaner and swiss cheesed engine cover on my DX.